The annual Game Developers Conference is scheduled for the coming week, and in anticipation of the world’s largest professional game industry event, Microsoft has announced Game Stack, an ecosystem of game-development platforms and the much-anticipated Xbox Live mobile SDK. 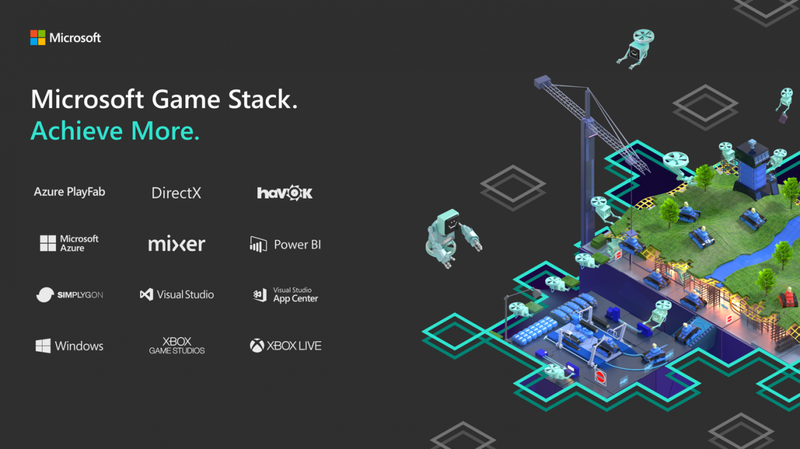 Game Stack brings together all of Microsoft’s game-development tools and services into a singular ecosystem, with the goal of making it easier for developers to find the tools that they need to build and operate their game. Game Stack comprises of tools like Azure, PlayFab, DirectX, Visual Studio, Xbox Live, App Center, Mixer, and Havok. Azure within Game Stack fulfills the needs of a cloud infrastructure in a game development environment, providing services like cloud compute, cloud storage, push notifications, as well as cloud-native services like machine learning and AI. Companies like Rare, Ubisoft, and Wizards of the Coast are hosting multiplayer game servers and undertaking other activities like game telemetry analysis to create more immersive gameplay. PlayFab Matchmaking (Public Preview): Matchmaking adapted from Xbox Live’s matchmaking, but made available to all games and devices. PlayFab Party: Voice and chat services adapted from Xbox Party Chat, but made available to all games and devices. Party also utilizes Azure Cognitive Services for real-time translation and transcription. PlayFab Game Insights: Real-time game telemetry to measure game performance. Game Insights will also offer connectors to first and third-party data sources, including Xbox Live. PlayFab Pub Sub: Push messages from PlayFab’s services through a persistent connection, to enable features like real-time content updates and matchmaking notifications. PlayFab User Generated Content: Originally built to support the Minecraft marketplace, this service will enable developers to allow players to create and share content with each other. PlayFab and other Game Stack tools will continue to see deeper integrations within each other, allowing developers to consider Microsoft’s solution as a one-stop-shop. For example, crash log data from App Center is now connected with PlayFab, allowing the developer to better understand issues in the game by tying the crash logs back to the individual player profile. PlayFab is also sporting a new plugin for Visual Studio Code, making it easier to edit and update Cloud Script. Microsoft is promising many more such integrations in the future. Xbox Live does form part of Game Stack, but the introduction of this new SDK deserved its own space in the announcement. Xbox Live is Microsoft’s online multiplayer gaming and digital media service which was introduced with the Xbox, but has since been extended to later generation Xbox consoles, Windows as well as to the now-dead Windows Phone platform. Under Game Stack, Microsoft is expanding Xbox Live’s cross-platform capabilities with a new SDK for iOS and Android devices. Xbox Live will provide identity and community services within Game Stack, with the ability to support log-on, privacy, online safety, child accounts, achievement tracking and more. This service does leave out other non-Microsoft consoles, but that was to be expected and unsurprising. However, the Nintendo Switch was mentioned in the GDC Talk Schedule for Xbox Live, but is not mentioned anywhere in the press release. Microsoft is showing off Game Stack and associated services at GDC 2019. If you are at GDC, you can head on to the South Hall of the Moscone center to try them out and learn more.